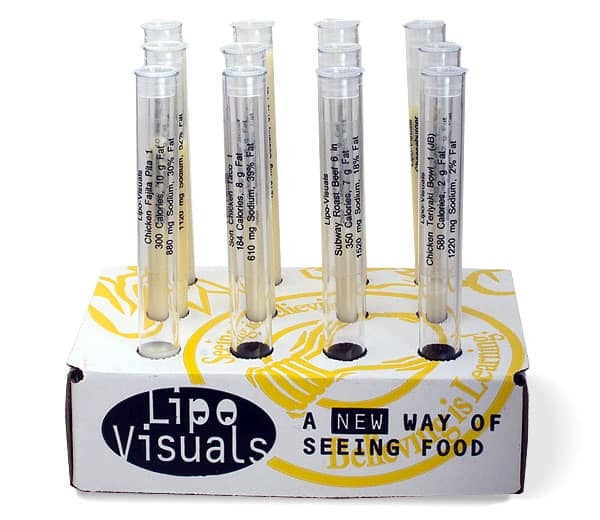 Lipo-Visuals Fast Food 12 pack fat test tube 12 pack shows fat facts in the 12 most popular fast foods. 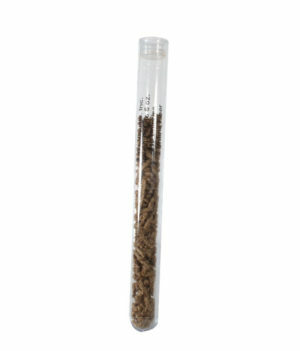 Each fast food nutritional test tube set comes with a teaching handout packed in a sturdy corrugated cardboard box that converts into a test tube rack. Each fat tube label states the calories, fat grams, percent fat, and milligrams of cholesterol. Show your audience the fat facts on their favorite fast foods. Show them how much fat is in the foods they are eating. Compare the fat facts in a quarter pounder with cheese versus a roast beef sub or a blizzard vs a chocolate shake. People are always shocked and amazed when they pick up our fat test tubes. They really cannot believe there is that much fat in one burger or their favorite French fries.